When I was 22, I bought my first piece of “art” at a flea market while visiting Orange County, California on vacation. 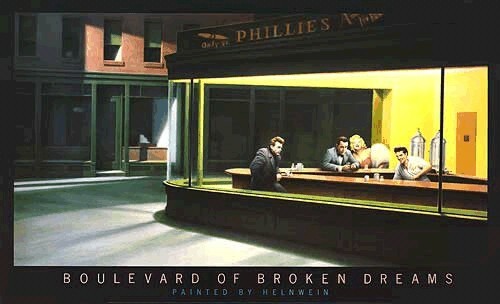 It was a print of Gottfried Helnwein’s Boulevard of Broken Dreams. Proudly, I carted the framed print back to my small Missouri town and hung it prominently on the living room wall in my apartment. Every morning when I woke up and walked into the living room, I gazed happily at my purchase. I’d look at the images of Marilyn and James Dean and Elvis and Bogart, trying to understand something great about art and myself. I loved the picture because it reminded me of a painting I loved called Nighthawks that was one of the works of art in the childhood board game, Masterpiece. Somewhere between 1990 and now, I did become a little more sophisticated in my relationship with art, though I will never be an art historian or expert. I moved to New York in 1992 and spent a lot of time going to the Metropolitan Museum of Art and the Museum of Modern Art and other New York museums where I discovered the works of American realist Edward Hopper with my own eyes. For the longest time, I would tell people that Hopper was my favorite artist. There is an exhibit that just opened at the Whitney, the first major museum exhibition to focus on his drawings and creative process. 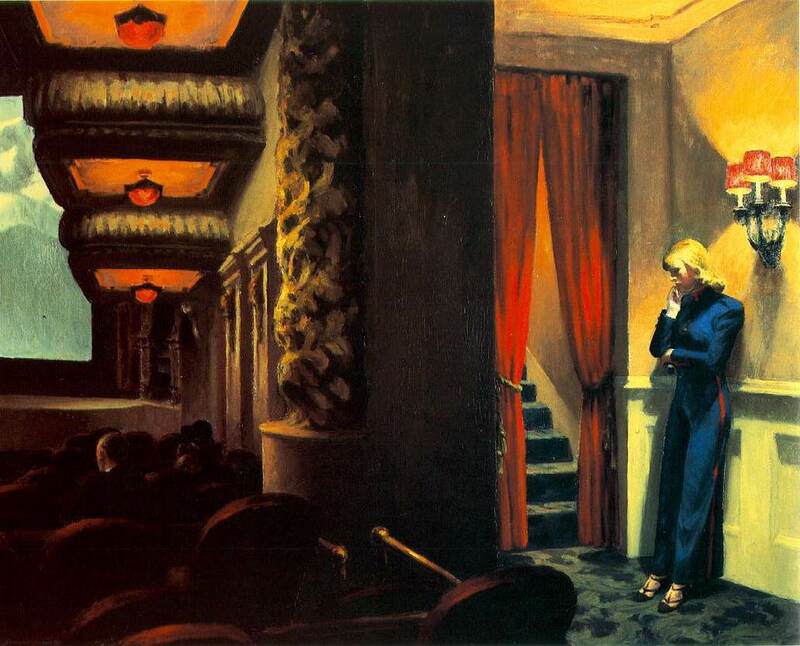 In the last few years, it seems like Hopper is more popular than ever and I believe what makes him so beloved is the fact that anyone can look at a Hopper painting and be moved by it. He evokes childhood, he evokes a simpler time. His subjects are lonely, staring into space or their cup of coffee. We relate to his art. 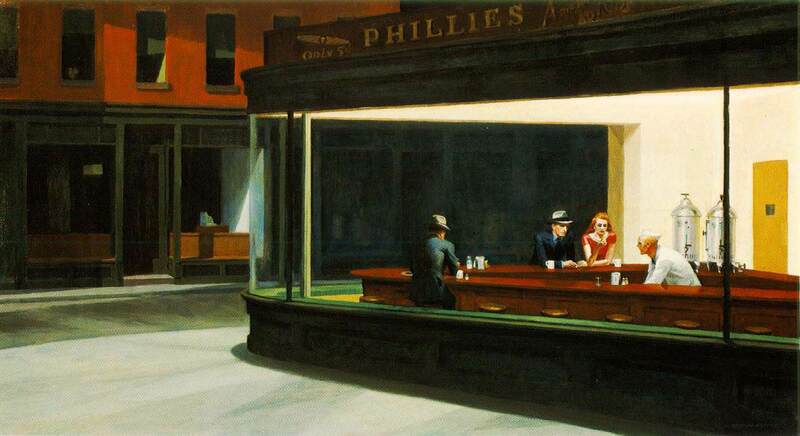 When I lived in New York, I would go to the 24 hour donut shop on my corner and I felt like I was living Nighthawks. When I look at the gentleman at his gas pump in Gas, I think of my father who owned gas stations when I was growing up. The few times I worked an office job, I spent way too much time daydreaming like the man in Office in a Small City. Even now, when I walk into an old theatre, I think about the lonely girl standing at the rear in New York Movie. 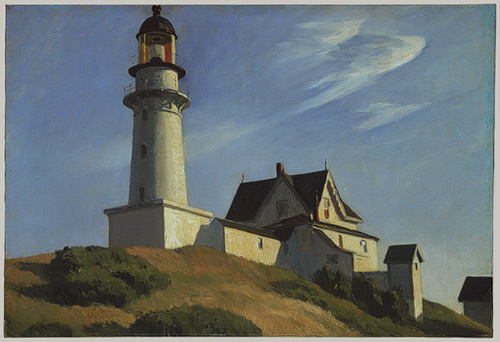 Art is subjective, thank goodness, but Hopper is, in my humble opinion, among the most universal of artists. Now that I am a little older, I think of Edward Hopper a little differently. I still count him among my favorites, but I always think of him as the first painter I really loved, the first one who I felt like he was painting just for me. 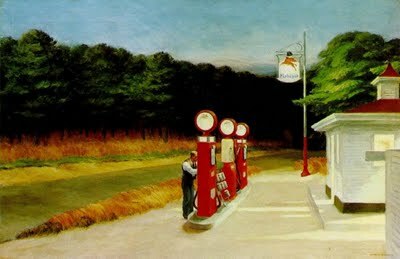 When I look at the paintings of other artists I now gravitate to, like John Sloan, or Winslow Homer, or George Bellows, or Thomas Eakins, or John Koch, there is almost always a recognition that I love them because they remind me a little of Hopper. My apartment walls no longer boast mass market prints, but rather paintings and photographs that Eric and I have collected through the years. Some were collected at yard sales. Some were gifts. 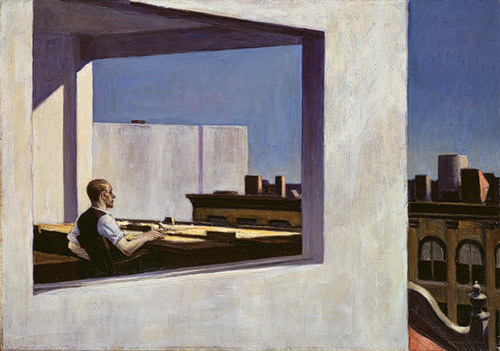 And many remind me of the works of Edward Hopper. It makes sense, because, of course, you never forget your first.